amount by which it must be changed to bring the peak to the center indicates how far off the receiver calibration is. Referring back to Fig. 447, the peak was brought to the center by changing the receiver tuning from 600 kc. to 595 kc. This means that the receiver calibration at 600 kc. is off by 5 kc. It should be clearly understood that the optimum adjustment is attained when the r-f. and detector stages are tuned to the incoming signal and the oscillator frequency is higher than the signal frequency by the amount of the intermediate frequency. In this case, the r-f. and detector stages are tuned to 600 kc. and the oscillator frequency is 1050 kc. Figs. 448, left, 449, middle, 450, right. An incorrect adjustment of the series oscillator trimmer is shown in Fig. 448. Figs. 449 and 450 indicate the correct condition, the receiver tuning having been changed to obtain Fig. 450. The procedure to be followed when the double image system is used requires further explanation. In general, a double trace will appear on the screen when the receiver and the signal generator are tuned to 600 kc. Now the important point is this: in contrast to the usual procedure, wherein the trimmer adjustments are made so as to bring the two curves into coincidence, in this case the series oscillator trimmer is adjusted for maximum output, regardless of whether this may or may not bring the two curves together. Fig. 448 shows the incorrect adjustment made so that the two curves are brought into coincidence. The improvement in sensitivity, when the series oscillator trimmer is adjusted so that the peak height,of the curves is a maximum, is shown in Fig. 449. Note that while the curves no longer coincide, at the same time, the gain and selectivity of the receiver have been appreciably increased. The curves, of course, can be brought together by retuning the receiver. Again the amount by which it is necessary to change the receiver tuning is a measure of the extent to which the calibration is off. The appearance of the trace when the curves are brought together is shown in Fig. 450. The panel view of this instrument is shown in the accompanying illustration. This oscillograph is designed to be used for visual alignment work in addition to the general uses for the oscillograph. It incorporates two audio amplifier stages, linear from 15 to 100,000 cycles which can be used to amplify the signal to both the vertical and horizontal deflection plates. Separate gain controls are provided for these amplifiers. 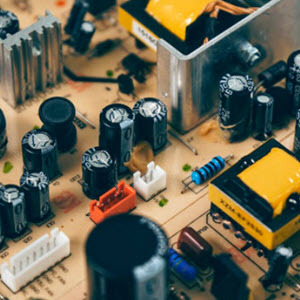 Switches are provided for turning off the amplifiers independently of each other and for connecting the oscillograph input terminals directly to the cathode-ray tube plates or to the input of the amplifiers. In each case there is a condenser in the input circuit. On the right is shown the panel view of the Dayrad Series 65 Oscillograph. All the controls are on the front panel with the exception of the horizontal and vertical spot positioning controls, which are on the side of the cabinet. A 1000-cycle, frequency-modulated oscillator is incorporated in the unit. Courtesy of The Radio Products Co.
60-cycle synchronization. The focus and intensity controls are located on the front panel; horizontal and vertical spot positioning controls are located on the side of the case. A 1000-kc. oscillator is incorporated within the oscillograph unit, as is also a motor-driven condenser, which is used for frequency modulation. Two ranges of capacity are available by means of a switch. This motor-driven condenser unit provides a band width of 20 kc. for use in connection with visual alignment. The frequency modulator, which can also be used in conjunction with any standard test oscillator, is self contained for the 1000-kc. frequency. A fixed timing axis oscillator is used when the oscillograph is employed for visual alignment work. 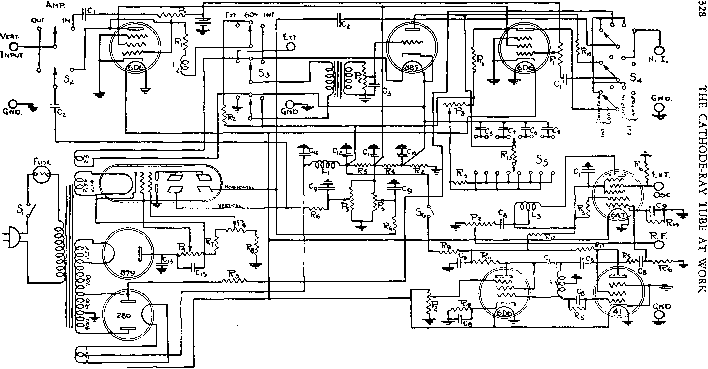 Schematic diagram of the Supreme Model 555 oscillograph. The functioning of the frequency modulator is explained on the opposite page. This consists of a condenser charging circuit and shorting cam, which works on the same motor shaft as the frequency modulator; in this way the resonance curve is kept on the screen, regardless of shift in line voltage or change in motor speed. The Supreme Model 555 Oscillograph has incorporated in it a signal generator with a frequency range from 125 kc. to 60 mc. Thete is also an a.-f. generator whose output ranges from 50 to 10,000 cycles. circuit of the fixed-frequency oscillator. This is heterodyned with a variable-frequency oscillator and produces the range of frequencies mentioned above with a constant band-width of 24 kc. A transparent celluloid screen, calibrated in kc. off resonance, is provided for quantitative measurements. The system of frequency modulation employed in this oscillograph is of interest. A 60-cycle sweep voltage is applied to the horizontal plates, and at the same time a 120-cycle current is passed through the partially-saturated iron core of the fixed-frequency oscillator which normally operates at 600 kc. This 120-cycle current is obtained from the output of a full-wave rectifier. As a result of the variation of the saturating current of the iron core, the oscillator frequency is varied from 588 kc. to 612 kc. at such a rate that the output of the oscillator sweeps through 600 kc. four times in each complete cycle of the horizontal spot movement. It follows, then, that four complete resonance curves are traced out each time the spor travels back and forth across the screen of the cathode-rav tube. because of the comparatively slow horizontal movement of the spot ai the extremities of the screen. This slow movement is due to the faci that a sine-wave voltage is used for the horizontal sweep, as we mentioned above. The phasing of this 60-cycle sweep voltage is permanently adjusted at the correct value and no synchronizing adjustment is necessary when the oscillograph is used for alignment work. It is important to note that the resonance curves which appear in the center of the screen are both due to frequency sweeping through resonance in the same direction. The fact that one image is reversed from left to right with respect to the other, is due to the fact that the spot is travelling in different directions for the two traces. This type of double image pattern should be distinguished from the conventional type of pattern in which the two traces are due to resonance curves which are traced out by the frequency of the signal generator sweeping through resonance in different directions. In addition to the r-f. signal generator, the oscillograph contains an audio oscillator, continuously variable from 50 to 10,000 cycles. The oscillograph is provided with both horizontal and vertical amplifiers. The gain of these amplifiers is 40 and the frequency response is substantially flat from 20 to 90,000 cycles. The switching arrangement permits the signal under study to be fed through the amplifiers or connected directly to the plates. Each amplifier is provided with a gain control and a scale graduated in 50 divisions to facilitate comparative tests. The left pat tern shows thi circuit in resort ance and that a, the right, the circuit out of res< onance. These oscillogrami made with the Supreme 555.
permit internal, external or 60-cycle synchronization. Included among the controls are the intensity, focus and spot positioning controls. The convenient arrangement of the controls is evident in the accompanying illustration. The effectiveness of sweep synchronization at the higher frequencies in models bearing serial numbers up to 1000, can be improved by replacing condenser C-18 with a y4-watt, 10,000-ohm resistor. This condenser is easily accessible, being mounted at the end of the resistor-condenser board, which is in a vertical position near the front of the chassis. As may be seen by reference to the schematic, which appears on page 100, this condenser is shunted across the secondary of the synchronizing transformer T-2 and so tends to bypass the synchronizing voltage at the higher frequencies. There is no necessity for making this change unless the oscillograph is used at frequencies above 25 kc. On the right is the front view of the Hickok Model RFO-1 Oscillograph. 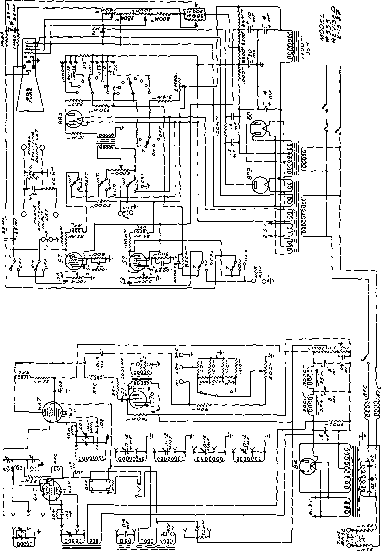 The schematic diagram of this instrument will be found on the next page. In the revised model the spot positioning controls, as well as all the others, are on the front panel. 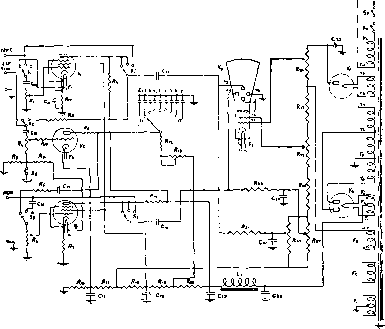 Courtesy Hickok Electrical Instrument Co.
Schematic diagram of the Hickok Model RFO-1 cathode-ray oscillograph. of either internal, external or 60-cycle synchronization. Focus and intensity controls, as well as horizontal and vertical positioning controls, are located on the front panel. The radio-frequency section of the oscillograph unit provides a frequency-modulated output at 700 kc., the band-width being variable from 5 kc. to 30 kc. The output of this oscillator is variable up to 3 volts, and contains sufficient harmonic output to permit alignment up to 10 mc. The choice of self-contained frequency is convenient in that it permits visual alignment at both 700 kc. and at 1400 kc. This fre-quency-modulated oscillator can be used in conjunction with a standard test oscillator to provide a frequency-modulated signal of variable frequency by the usual heterodyne method, the extent of frequency modulation remaining constant. The tubes used are 1-906 cathode-ray tube; 1-879 half-wave rectifier; 1-885 gaseous discharge tube; 1-6D6 as an electronic frequency modulator; 2-6D6's as horizontal and vertical deflection amplifiers; 1-41 as an r-f. oscillator. The range of the Triumph frequency-modu-lated oscillator, Model ISO, is from 100 kc. to 33 mc. The frequency modulation is accomplished electronically. width constant at 30 kc. over this entire range. Constant band-width is secured by heterodyning a frequency-modulated "fixed-frequency" oscillator, working at 840 kc., with a variable-frequency oscillator contained within the unit. A dual attenuator is provided for controlling both the input to and the output of the mixer tube. The frequency modulation is accomplished electronically. If a frequency-modulated signal is not desired, a switch is provided so that the instrument can be used for conventional alignment work. Triumph Model 800 Cathode-Ray Oscillograph. Schematic diagram of the Triumph Model 800 cathode-ray oscillograph. Note the two rectifiers, the type 879 supplying the high voltages for the cathode-ray tube, type 906, and the type 80 supplying the bias and plate voltages for the remainder of the tubes. amplification of approximately 40. A type 80 tube is used to supply power for both amplifiers and for the linear sweep circuit, which employs an 885 tube. A type 879 rectifier supplies the high voltage requirements of the 906 cathode-ray tube. The input impedance, when using either amplifier, is 500,000 ohms. When using the direct connection to either set of plates, the input impedance is one megohm with d-c. blocking condensers within the unit. The deflection sensitivity is 75 volts per inch or 27 rms volts per inch directly to the plates and with either the vertical or horizontal amplifiers, the sensitivity is increased to about 2 peak volts per inch or 0.7 rms volts per inch. On the right is shown the Triumph Model 800 oscillograph, the schematic diagram of which appears on the op. posite page. The various controls are described in the accompanying text. accompanying illustration, are the following: focus, intensity, vertical selector switch (providing a 60-cycle, direct, or through amplifier connection to the vertical plates), internal-external synchronizing switch, locking control, step and vernier sweep-frequency controls, horizontal gain, vertical gain, and horizontal selector switch. The schematic is shown in the accompanying figure. A new cathode-ray tube which is characterized by its small size and low cost, has recently been announced by R.C.A. While this tube differs in construction from the larger tubes which have been previously described, the application of the tube is essentially the same. For this reason it is unnecessary for us to explain here how the tube is employed for the study of waveforms, modulation, frequency measurements, etc. The 913 cathode-ray tube is of the high-vacuum type, utilizes the all-metal type of construction, and employs a viewing screen which has a diameter of approximately one inch as compared with the conventional tube, which has a diameter of at least three inches. It contains two sets of deflection plates which are at right angles to each other, and, as in the case of the 906, one plate in each set is tied to a common point inside the tube. The low voltage requirements of the tube are of special interest inasmuch as a brilliant green trace is obtained at voltages as low as 250 volts. The introduction of this tube has already greatly extended the field of application of the cathode-ray tube and promises to continue to do so. In many cases this does not mean that the larger type of cathode-ray tube will be displaced, but rather that the low cost, small size, and low voltage requirements of the 913 are making for its use in equipment which would not ordinarily employ a cathode-ray tube. In service equipment where a large image, although desirable, is not essential, the new tube is rapidly becoming an integral part of the equipment being offered to the serviceman by the instrument manufacturers. Aside from the additional saving in space and the increased portability, made possible through the use of the 913 in such equipment, the lower cost is enabling more and more servicemen to afford and enjoy the advantages and help of the cathode-ray oscillograph in diagnosing faults in radio receivers and public address equipment. The cathode-ray oscillograph and the frequency modulated signal generator can be used for aligning automatic frequency control circuits, and in this connection two typical oscillograms indicating correct and incorrect alignment are shown in the accompanying figure. The left oscillogram shows the A.F.C. circuit in correct alignment and the other, incorrect alignment. While it is not possible for us to go into any detail as to the various connections and considerations involved in this type of alignment work, the entire subject of automatic frequency control is fully covered in another book by this author.